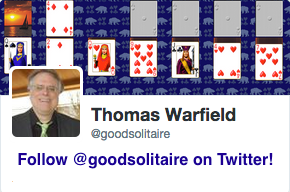 Screen shot of the game Canister from Pretty Good Solitaire. American Canister is a FreeCell type game and is also a Castle type game. It is right on the edge between the types and shows the similarity between the two groups. 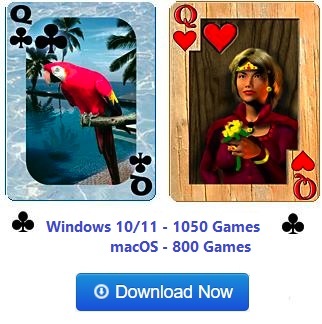 If you are an avid FreeCell player, you may find many of the Castle type games of interest as well. American Canister is an open game, which means that all the cards are dealt out face up. At the start of the game, then entire single deck is dealt out to 8 piles, in the same way as in FreeCell, seven cards to four piles, six cards to another four piles. 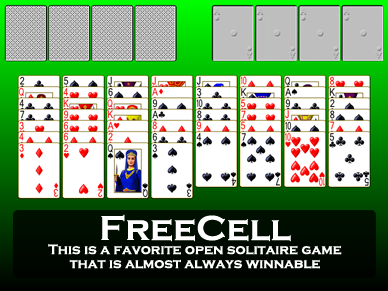 It will look exactly like FreeCell, except there are no cells. The object is to move all the cards to four foundation piles, up in suit, as usual. In the tableau, building is down by alternate color. Spaces can be filled with any card. Groups of cards in sequence down by alternate color may be moved as a unit. 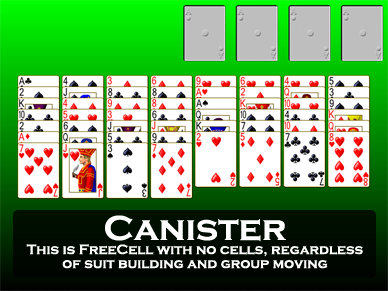 Note that unlike most FreeCell type games, American Canister has no restrictions on the number of cards you can move as a group based on empty cells. There are no cells. American Canister is therefore not FreeCell with no cells - that would be the game called Bucket in Pretty Good Solitaire. American Canister is like Bucket but easier since groups of cards in sequence can be moved. American Canister is also very similar to the Castle type game Canister. Canister is a somewhat easier game with building regardless of suit rather than alternate color. According to the high scores site, the average score for American Canister is only 2.5%, so American Canister is a very difficult game to win.